The quest for the hidden jewels is under way, and you must lead the expedition! Click here to play! There are countless unknown treasures waiting for you to find them, with massive cash jackpots on offer for your discoveries. 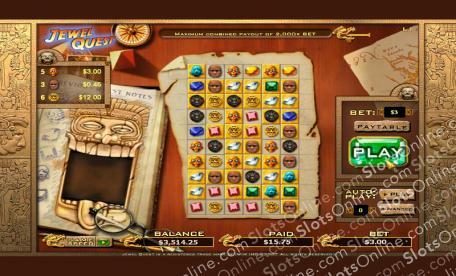 Jewel Quest is an exciting adventure slot that offers five unique levels to play across. Wagers are based on a level-by-level basis, and there are no traditional lines or reels. Winning combos are achieved when three or more identical symbols appear up, down, left, or right. Once you are paid out, those symbols will disappear and be replaced by new symbols; once all payout options have been completed you will progress to the second level. Combinations are paid out on three or more identical symbols, and if you manage to earn all 11 in one turn you could earn up to 2000 times your initial wager. Discover your hidden riches today in the exciting slots adventure: Jewel Quest!